How Many Access Points to Buy? How's it All Going to Work? Are There Too Many Client Devices? What Does the User of Your Network See? How do You Avoid Those Angry Complaints About Your WiFi Network? 5GHz WiFi Coverage on the 5th floor. Grey indicates coverage holes (less than the desired -65 dBm signal strength). Wireless network installation is a complex task that involves many invisible and unpredictable variables such as RF signal strength, noise level, data rate, channel allocation, user density, and so on. Since all these factors ultimately affect wireless LAN network performance, it is necessary to perform wireless site surveys to fully understand the behavior of radio waves within a facility before installing wireless access points. 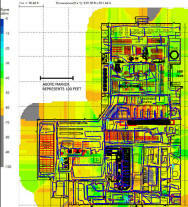 RHO Wireless uses the Fluke AirMagnet Site Survey Pro software application to aide in determining the optimal number and placement of wireless LAN infrastructure devices to provide the best coverage and throughput required by your wireless users. 1. 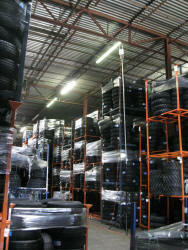 A site survey can determine the minimum number of access points for the deployment. This saves the organization time, money and effort, by preventing the deployment of unnecessary access points. 2. A site survey can ensure that the signal strength meets your requirement to ensure good coverage of your wireless deployment area. 3. Site surveys can be used to measure real-world performance metrics for the wireless LAN, so network performance is assured. Real-world situations on the network, including, multipath issues, device configuration issues, and interference issues can be assessed. 4. 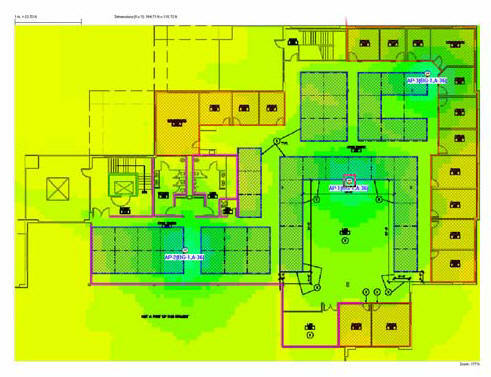 A professional site survey can produce an optimal design for multi-floor environments and RF coverage between floors can be visualized. As wireless LAN signals travel across floors, multi-floor deployments may not require access points on every floor, or the same number of access points on every floor. Have all the stakeholders in the project been identified? This may include a large group of people who may be directly or indirectly involved with the site survey project or the enterprise LAN or wireless LAN. Who will perform the survey? Who will be making all the design decisions? Who will approve the project or the budget for the project? Who will install the access points once the design is finalized? Who will assign the IP addresses to be used on the access point? Who knows where or how to run Ethernet and/or power cables to the access points? Is wireless access needed for indoors or outdoors or both? Are any building blueprints or floor maps available? If not, how can they be obtained? Are there digital copies available? Where do you require coverage? 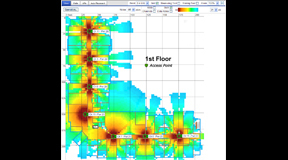 Do users need wireless LAN access at every location on the floor or only in a certain areas? Are you planning to use Voice over WiFi (VoFi)? 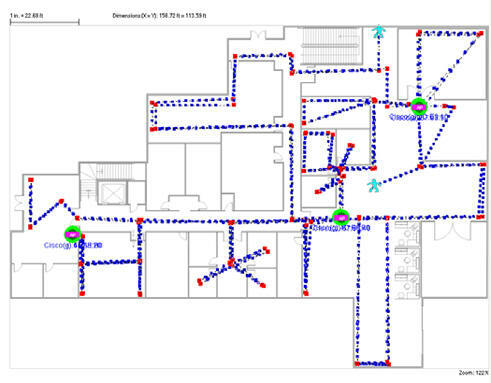 Are you planning to implement a wireless Real Time Location System (RTLS)? What type of business is it? This will influence the type of applications that will run over the wireless LAN and influence your design decisions. For example, for a hospital deployment it is important to know that there are multiple sources of interference. Also, voice and other bandwidth and time-sensitive applications could be used over the wireless LAN. Is this a new deployment or an add-on to the existing wireless network? If new access points are to be added to the existing wireless network, where are the existing access points located? How are they configured? Why are you deploying more access points? Are you unhappy with your current network? Are users complaining? Is the business simply expanding and new users or applications need wireless support? What about capacity? How many users require a wireless connection and what applications will they use? What is the geographical distribution of the users? Will they be using applications where they need to roam? What are their throughput requirements? Are there any known major non Wi-Fi interfering sources? For example, wireless video surveillance systems or wireless alarm systems? Do you know their locations? 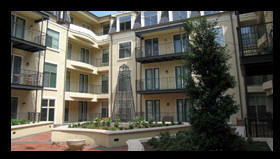 Are you worried about interference from your neighbor’s facility? wireless LAN design decisions may have to be made to work-around certain interference sources. Is this a multi-floor deployment? Access point resources can be reused across floors to save deployment time, money and effort. Where are the power and Ethernet drops throughout the facility? Are you open to installing new drops? What is the anticipated growth for the future? Will you be hiring new users, implementing new applications or new technologies? At times, it is better to just plan the network deployment to absorb all these changes in the future to make the best use of your investment. 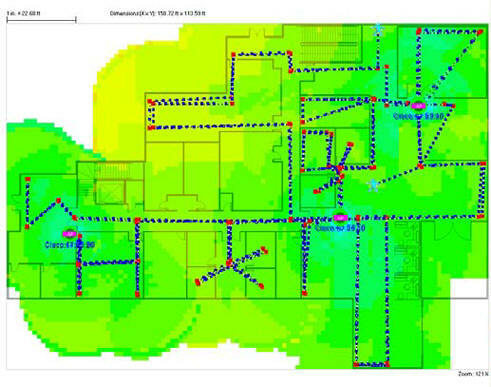 The Predictive Coverage Analysis starts with a site plan. The Predictive Coverage Analysis starts with a detailed site plan. 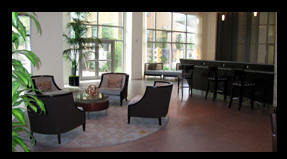 A floor plan image or CAD data is required for all of the buildings and all of the floors. Supported formats for the floor plan images are: bmp, dib, dwg, dxf, emf, gif, vsd, jpg, and wmf. The more detailed the better, especially if the drawings have wall types or show were double wall thicknesses have been used. The type (802.11 b/g/n, 802.11 a/n, or 802.11 a/b/g/n, 802.11ac), the make, and the model of the access points needs to be identified. If you haven't decided on the access points, we can make a recommendation based on your requirements. Symbols for the type and brand of the access points to be deployed are then placed on the site plan. The AirMagnet Survey Planner produces a graphical data display with a color spectrum and RF gradient that makes it easy to understand and differentiate the expected RF wireless coverage and throughput. This allows the wireless LAN network plan to be based on “facts” rather than “hypotheses”. The AirMagnet Survey Planner also helps determine the ideal arrangement for the access points and it creates a site plan showing the access points at their planned locations. The site plan generated by the predictive coverage assessment and analysis serves as the basis for the site's visual inspection and the pre-deployment site survey. A budgetary estimate for the access points and their installation can be accomplished now that the number and locations of the access points are known. The Predictive Coverage Analysis and Network Plan. The next step is either a site visual inspection or the pre-deployment site survey. If you are planning to deploy a Cisco Wireless Network and to use the Cisco Network Control System (NCS) or Wireless Control System (WCS), the site plan and predictions can be exported and provided to you for upload into the Cisco NCS or WCS. The assumptions for the types of the walls included in the predictive analysis are verified during the visual inspection. The assumed access point locations are also verified. 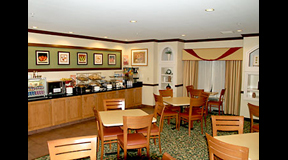 Many times during the visual inspection it is determined that an access point's location can not be supported and the access point must be moved due to the location of light fixtures, sprinkler heads, pipes, air conditioning vents, or other real world physical structures that were not shown on the floor plan. In the event that the wireless site survey is needed for new construction, such as an apartment building, then a visual inspection cannot be accomplished. Instead a limited pre-deployment site survey of a similar build should be considered to verify that the predicted wall and floor attenuation factors used in the predictive coverage analysis are correct. A properly conducted pre-deployment survey can help ensure that the ultimate network installation operates at peak efficiency with a minimum of extraneous or conflicting components. The process outlined below is designed to help define the network environment prior to actually installing any network components. The RF data may include: signal strength, channel allocation, noise level, signal-to-noise ratio, coverage, media type (2.4 GHz or 5 GHz), transmission speed, packet loss and retry rates. AirMagnet Survey Pro can “pick up” any RF data that exist in a wireless LAN environment, including data from neighboring WLANs or access points. During the site survey, the wireless network adapter does not associate itself with any particular access point or SSID. Instead, it listens to the RF data moving through the site. All RF signals and noises in the environment are detected and recorded. The survey gathers available 802.11 information present in the wireless environment. 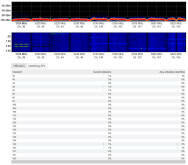 This allows any traffic present to be recorded and analyzed, be it from a neighboring network or from ambient noise. Pre-Deployment Site Survey showing the survey path. 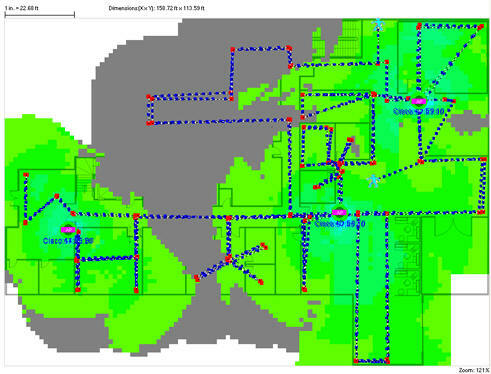 Using the site plan developed in the Predictive Coverage Analysis as a guide, a site survey of the entire site (broken up into several shorter surveys, if necessary) is completed in order to collect ambient traffic, noise levels, and frequency usage. A test access point or multiple access points are placed in the location determined by the predictive analysis and as many surveys as needed are conducted to ensure that the planned coverage area is verified. This allows the attenuation factors used in the predictive coverage analysis to be verified or, if necessary, updated. The survey data is saved at the end of each survey. There may be several survey data files for the site survey depending on the number of access point locations. The survey files are merged by AirMagnet Survey Pro for analysis and subsequent reporting. 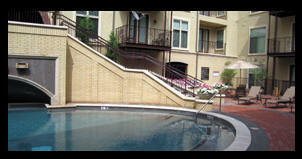 If the site has multiple floors, a survey should be completed on the floor above and below. This allows the attenuation factors for the floors to also be verified. The test access point or points are then moved to the next planned location and the survey is repeated. 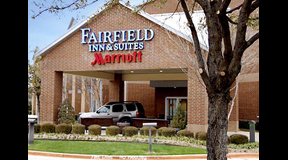 Surveys are completed for each planned access point location until all access point locations have been verified and/or adjusted, if necessary, to meet the coverage requirements. 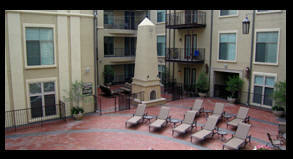 Pre-Deployment Site Survey Coverage and Access Point Placement Verification. If there is any channel conflict among the access points. The results of the surveys are saved for comparison with the data collected in the Post-Deployment Site Survey. If you are going to use the Cisco Network Control System (NCS) or Wireless Control System (WCS), the site plan and pre-deployment site survey results can be provided for upload into the Cisco NCS or WCS. shorter surveys, if necessary) and compared to the results of the pre-deployment site survey. Any required adjustments are made that were not accounted for in the pre-deployment portion in order that the network meets the user and throughput requirements. Step 2 is necessary due to the fact that some factors cannot be accounted for during the planning and pre-deployment process. For example, having people moving through the wireless environment can cause interference that would not be there prior to a complete wireless network installation. Post-Deployment RF Signal Strength Analysis. If you are using the Cisco Network Control System (NCS) or Wireless Control System (WCS), the site plan and post-deployment site survey results can be provided for upload into the Cisco NCS or WCS. A Post-Deployment Site Survey should be completed every year or two in order to ensure that no coverage holes have developed in the wireless network and that the wireless network continues to meet your requirements.